The Castle Garden Emigrant Landing Depot (known to most as just Castle Garden) was the America’s first immigration landing station and opened on August 3, 1855. Unlike Ellis Island, which was operated by the United States Bureau of Immigration, the New York State Board of Emigration commissioners were in charge of Castle Garden. Located at the lower tip of Manhattan on the Hudson River within Battery Park, Castle Garden already had a long history. Designed and built by the Army Corp of Engineers for the United States War Department as a fortress to defend New York City from foreign attack, it was originally known as West Battery, then later Castle Clinton. It was built on a land-filled isle and was connected to Battery Park via a 200 foot drawbridge. In 1821 it was demilitarized and ceded to New York City in March 1822. Two years later it was renamed Castle Garden, and the city formally opened it on July 3, 1824 for public entertainment. It was here on September 14, 1824 that General Marquis de Lafayette would land once again on US soil. In 1844 work began on enclosing the Castle Garden, and the rotunda would be home to many musical events, including the opening of Jenny Lind’s, one of Sweden’s most renown opera singers, US tour. By 1848 plans had begun to enlarge Battery Park through landfill operations, which included the area around Castle Garden. So by the mid-1850’s Castle Garden no longer was isolated on an island, but would be located at the water’s edge. This is how it would have appeared to my great-grandparents when they arrived. By mid-1855 public and theatrical events ceased at Castle Garden, and shortly thereafter it was converted to an immigration landing station. It is said that Castle Garden welcomed approximately 8 million immigrants in its 37 year history as an immigration station. The inside of the rotunda was divided into various bureaucratic departments that would facilitate the transition for those arriving immigrants from ship to transportation to their ultimate destination within the United States. Within the rotunda there was a medical examination department, waiting room, registry department, foreign currency exchange office, railroad department, telegraph office, letter-writing department, information desk, and forwarding department. Most of these departments were run by employees of the Garden, with the exception of the exchange and forwarding departments which were contracted out. By 1890 there were increasing complaints about unscrupulous acts to cheat the immigrants, most of whom spoke very little English, by overcharging for baggage forwarding and underpaying on money exchanges. In addition to the Garden’s various clerks, missionaries were often present, both aiding the incoming and looking for recruits. During the Civil War years, both the Union and Confederate armies recruited incoming single men to fight for their cause. One of the most famous to be recruited was Joseph Pulitzer of Hungary. Outside on the perimeter of the Garden were the ferries to the railroad depots across the Hudson River, the Labor Exchange for those looking for jobs (here one had to beware of swindlers), and the Ward Island Department. Those immigrants who did not pass the medical examination were sent to the Ward Island Department. Once registered these immigrants would be ushered to an awaiting steamboat and taken to the Verplanck State Emigrant Hospital on Ward Island, located in the East River. The island also hosted 2 barracks for destitute men, women and children (these immigrants would be singled out by the Registry Department). Immigrants that had contracted smallpox were sent to isolation on Blackwell’s Island. Castle Garden closed its doors as an immigration station on April 18, 1890, just one month after my great-grandparents passed through its doors. Arriving immigrants would be processed through the Barge Office, located near Castle Garden in the interim before Ellis Island opened in 1892. During these 37 years as an immigration station, many well-known people would pass through in addition to Joseph Pulitzer (noted newspaper publisher who established the Pulitzer Prize and endowed Columbia University’s School of Journalism), such as Mother Cabrini (a nun who was later canonized as Saint Frances Xavier Cabrini) from Italy, Oscar Hammerstein (theatrical impresario) from Prussia (Germany), Harry Houdini (magician) from Hungary, William Fox (founder of 20th Century Fox film studios) from Hungary, and Adolph Zukor (filmmaker and founder of Paramount Pictures) just to name a few. 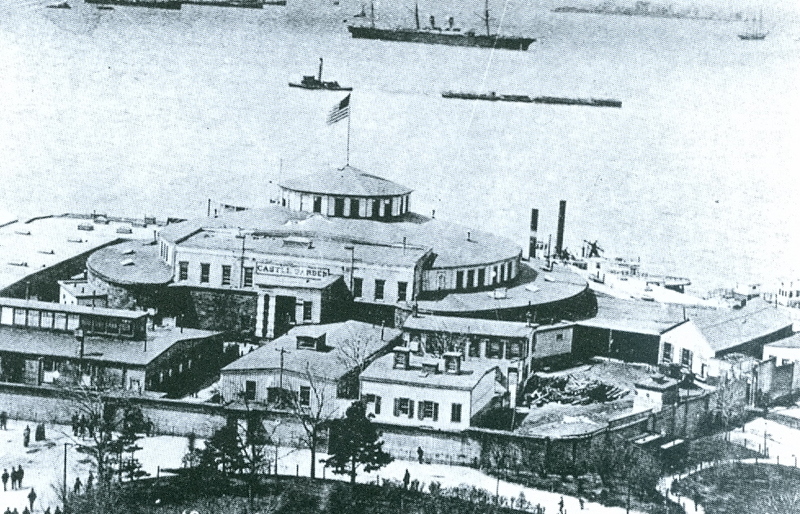 Castle Garden would reopen its door in 1896 as the New York Aquarium. This famous aquarium would operate here until September 1941. Robert Moses, then the New York City park commissioner, went forward with plans in 1942 to demolish the entire building in order to build the Brooklyn Battery Tunnel. But when the war interfered, the thick red sandstone walls were all that remained. Later it was determined that the old fortress did not need to be destroyed in order to build the tunnel. So for the next 8 years, Moses, preservationists, and politicians fought over the old fortress until the landmark was ceded to Washington in 1950. In 1970 the site was restored to its military appearance and renamed to Castle Clinton. The National Park Service maintains a permanent exhibit here of the history of the landmark. In 1986, a ticket office was opened within Castle Clinton for excursions to the Statute of Liberty, and later in 1990 to Ellis Island. Thanks for reading along…I hope my summary provided you a better understanding of the process your relatives endured in order to enter the United States in 1873. Through my research of my great-grandparents I gained a respect of their fortitude and courage to make such a journey from Europe, especially with very young children. Good luck with your research about your family roots.